The Air-Pot propagation / salad trays which yielded the first pickings of the year, will probably give the last pickings as well. 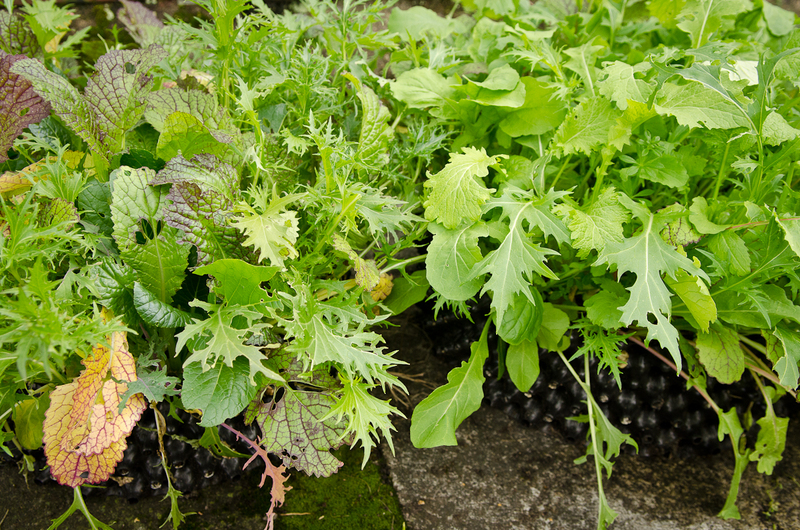 After mid-summer is when most of the oriental greens do best, I have sowed a succession of these and they are providing lots of green leaves for salads and stir-fries, they do not bolt so readily at this time of year and are quite happy outside in the cold and rain. It will be interesting to see if the salad supply can be maintained right through the winter. Another thing which can be planted now is garlic. My garlic at the plot was a failure due to white rot in the ground, so I bought disease-free seed garlic bulbs and planted them all in Air-Pot containers of various sizes. Healthy garlic cloves in clean compost and the superb aeration and drainage provided by Air-Pot containers should mean a good garlic harvest next year. Some will stay in Air-Pot containers to maturity, others in smaller pots will be planted out once the worst of the winter has passed, this will spare the garlic months in soggy, cold ground which is when the rot can set-in. What is your location where you are growing the garlic? Im located around Sacramento in California and just seeing when to start garlic and how did grow. What size container worked best, outdooors im assuming? Ive been using air pots for tomatoes and tomatillos and they have blown me away with growth and how fast they have grown. Being a first time airpot user I am in quite a water battle with my tomatillos but I got it drip lined and it is doing much better. Any advice would be awesome. We grow in Scotland, it surprises many people to know that garlic does well in northern climes being from Central Asia originally where winters are cold. 6 or 7 cloves planted in Autumn in a medium Air-Pot (30 cm / 12″ dia.) is about right. I know they’ll be happy outdoors in California especially if you have drip irrigation, I recall there is a lot grown around Carmel and an annual garlic fiesta. Be generous with the water so as to ensure it soaks right to the bottom and into the cones. It is sometimes beneficial to dunk the Air-Pot in a bucket of water for a few minutes if the compost has become too dry. You will be more expert than me regarding Tomatillo, I have never eaten one, but I have plants for the first time this year, they certainly seem vigorous & covered in flowers. I guess they might benefit from dunking or going in a bigger pot if they are drying out. A lot of general purpose commercial compost seems a bit lightweight and difficult to re-wet if it gets dried out, I find adding about 10% nice sieved topsoil or using a bit of soil-based compost (known as John Innes compost in the U.K.) helps with water retention and reduces shrinkage. Tomatoes just thrive in rich compost in an Air-Pot, we throw some extra chicken manure pellets into the the pot, this year we are trying the variety Gigantomo, £1000 prize money is being offered by Thompson and Morgan seed merchants for the biggest fruit, 1.3 kg (3 lb) fruit is possible apparently.